Ear surgery, otoplasty, usually takes about two hours, although complicated procedures may take longer. The appropriate technique will depend on the nature of the problem. Dr. Rajagopal makes a small incision in the back of the ear to expose the ear cartilage. Then she sculpts the cartilage and bend it back toward the head. Non-removable stitches may be used to help maintain the new shape. Occasionally, Dr. Rajagopal will remove a larger piece of cartilage to provide a more natural-looking fold when the surgery is complete. Another technique involves a similar incision in the back of the ear. Skin is removed and stitches are used to fold the cartilage back on itself to reshape the ear without removing cartilage. In most cases, ear surgery will leave a faint scar in the back if the ear, which will fade with time. 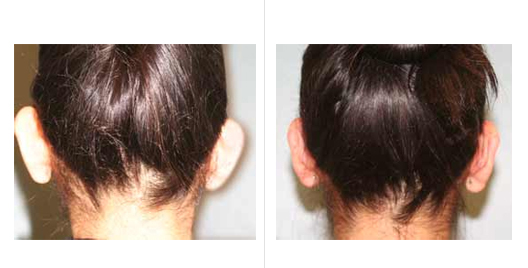 Even when only one ear appears to protrude, surgery is usually performed on both ears for a better balance. Both adults and children are usually up and around within a few hours of surgery. The patient’s head will be wrapped in a bulky bandage immediately following surgery to promote the best molding and healing. The ears may throb or ache a little for a few days, but this can be relieved by medication. Within a few days, the bulky bandages will be replaced by a light head dressing similar to a headband. Be sure to follow Dr. Rajagopal’s directions for wearing this dressing, especially at night. Stitches are usually removed in two weeks. Any activity in which the ear might be bent should be avoided for a month or so. Most children can go back to school after seven days or so, if they’re careful about playground activity. Learn about financing options, discounts and otoplasty cost on our costs & financing page. If you have any questions regarding Otoplasty (Ear Reduction Surgery), or wish to schedule a consultation with Dr. Rajagopal, please call the San Francisco Plastic Surgery & Laser Center at 415-392-3333.